The Munich X-Games are coming up on June 27-30. 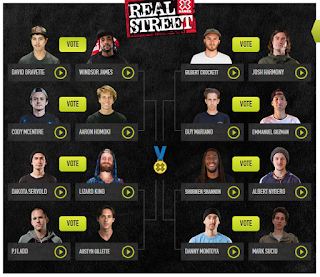 In anticipation of Munich, the X-Games have already opened up voting for the Real Street video competition, the winner of which will be decided and announced during X-Games Munich. The X-Games Real Street contest is a video contest where the X-Games picked 16 of the world's best skaters (sorry, no Nyjah Huston) who submitted 60 second video compilations of themselves ripping off their best tricks. These skaters face off in head-to-head matchups in a bracket, with the winners advancing to the quarterfinals, semifinals then finals, when a winner will be chose by a panel of skateboard "industry experts" - winner gets an X-Games gold medal. But the winner of the fan favorite category will be chosen by you, the fans. So check out all these amazing videos and vote up to once a day for your fan favorite. 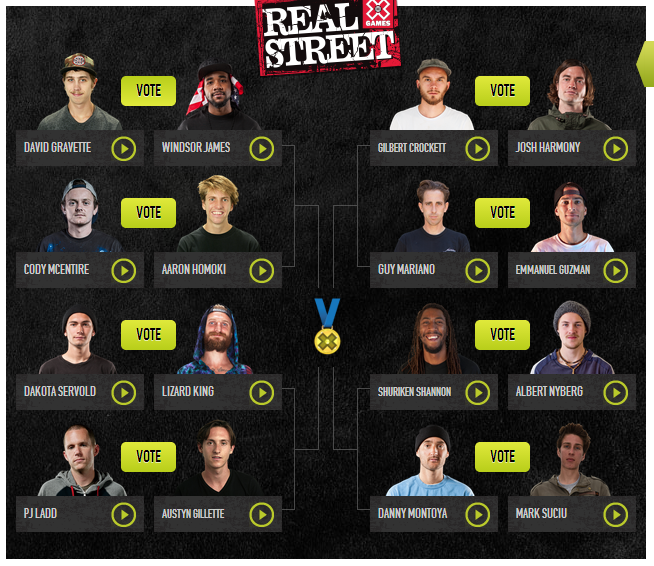 Who do you think is going to win X-Games Real Street Skateboarding gold: Danny Montoya, Windsor James, Gilbert Crockett, Emmanuel Guzman, Dakota Servold, Shuriken Shannon, Albert Nyberg, Mark Suciu, PJ Ladd, Austyn Gillette, Lizard King, Cody McEntire, Aaron Homoki, David Gravette, Guy Mariano or Josh Harmony? Check out their video parts and vote now!